Yes that is the back of the wheel, I photographed it that way as all the machining shots were from the same side. Buy cutting it that way up I could get the nut lower down which meant less of the 4mm dia cutter sticking out of the collet to avoid crashes. Tooling & Machines / Re: Going over to the dark (CNC) side! Pretty cool stuff Jason! Modeling the parts, creating the program, & watching it work, is pretty exciting. That looks really good Jason.A perfect demonstration of the benefits of CNC. Just one observation.- I think the central recess should be on the other side so that the teeth are facing to the right. Would you be willing to make a star wheel for me please? I would, of course, be happy to pay you for your trouble. A post on another thread brought up the subject of the "Star Wheel" used on the Alyn Foundry "Sphinx" engine which is an alternative to timing gears and operated the exhaust valve on alternate strokes. A casting is supplied but I happened to mention that it would be something worth trying to cut on the CNC. Well that was all it took to get me trying it out. 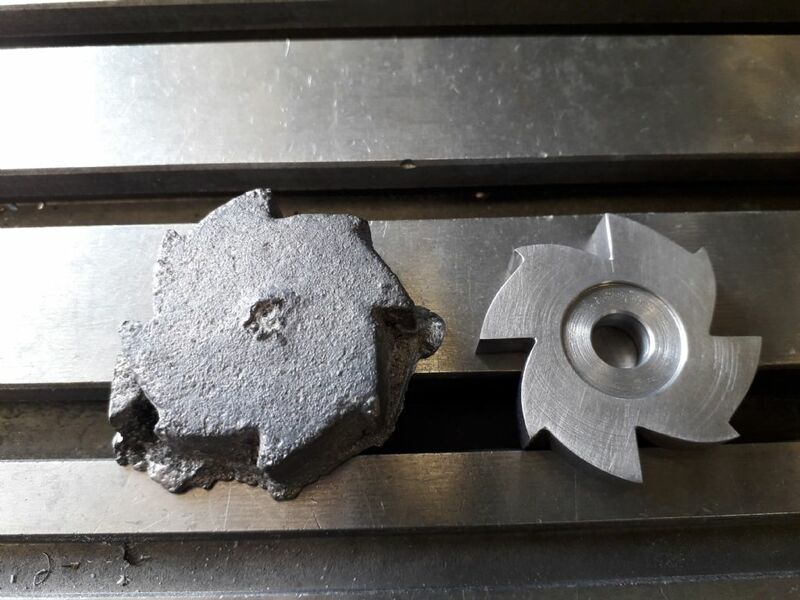 Video firstly shows the adaptive clearing, I speeded things up 20% after filming so that was a 6mm Carbide 3-flute cutter at 3600rpm, 150mm/min, full 8mm height cut with a conservative 0.25mm DOC. I went with Andrews suggestion of cutting both ways which reduced the time quite a bit. It was cutting very nicely and I did not bother with brushing on anymore suds which only seemed to make the swarf stick to the work. 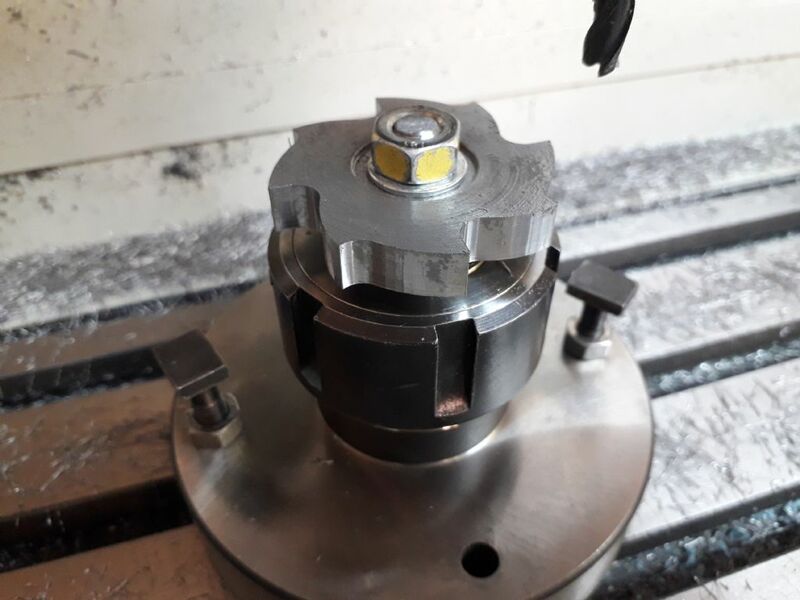 There is then a clip of a 4mm dia cutter clearing further into the internal corners which went well but during the final contouring cuts it went pop which almost made me go poop. It was a cheapie and at a cut height of 2D I was probably asking for trouble. I had drawn in a corner radius of 2.1mm but that probably should have been more. Video ends having reverted back to the 6mm cutter for the final contour cuts which I slowed down so that it would not chatter in the corners. This pic shows the star wheel after the first clearance cuts, you can see the faceting of the curves. This is after all the milling where the curves flow better. 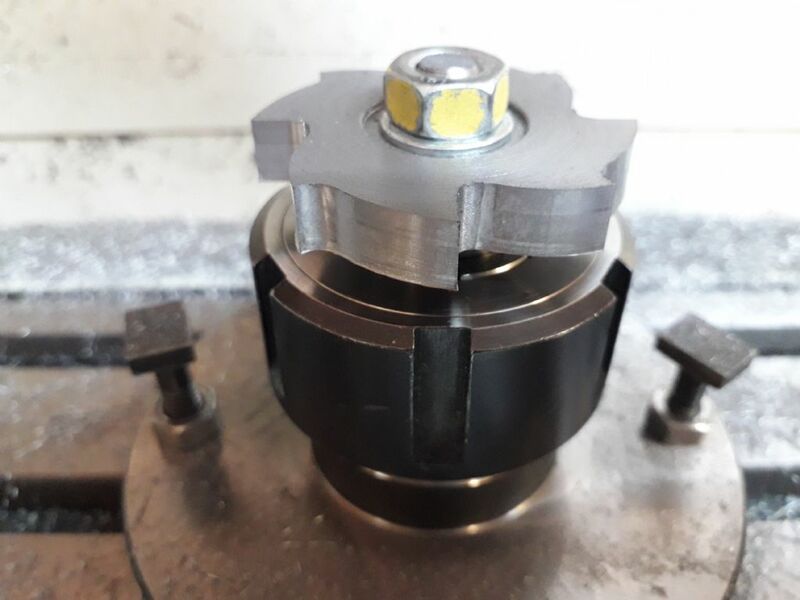 Interesting to see the three height bands left by the tool, although it has not done much they show the wear from the 2.5mm plate, the 1/4" flat bar and the best finish at the top which can be seen better in the video is unused edge. All that remained was to file out the internal corners, casting shown alongside. Just need to put it away somewhere safe and resist all temptation to do more on this engine for a while. I decided to CNC a Star wheel from scratch just to get some more practice with the KX-3, more details in the "going over to the dark side thread"
Silly question, but have you tuned the steps/mm on your printer so that when you tell it to print a 20mm cube, you get a 20mm cube? Before I fixed my first printer it was WAY off, a printed circle was visibly an ellipse. My second printer was not so bad, but it still needed to be tweaked a little. If you haven't been printing mating parts you might not have noticed any issues. Definitely a wise choice to go with the brass small pattern nuts, they look to be more of a "scale" size. My question, is there enough meat in the nut at size in brass, to hold against your steam pressure? The elves might not appreciate having to dodge any brass Frisbees. From Plans / Re: Edwards 5 Cylinders. 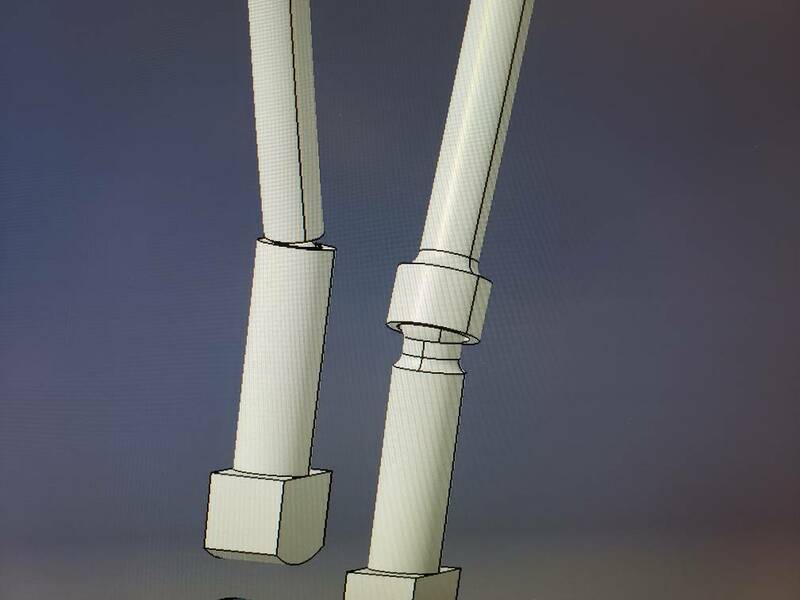 I redesigned the push rod, the cam follower and the rocker screw. The plan call for a 0.080" diameter socket. We dont have 0.080" ball nose. So i did it with a .125" socket to be able to use a .125" ball nose. Nice work on the drill press. How do you like the vibratory tumbler?